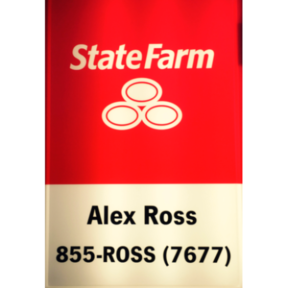 State Farm Insurance | Alex Ross Insurance Agcy Inc. This is not a commitment to lend money of any kind. This calculator is for illustrative purposes and estimates are based on a generic calculation with regard to the information you provided. Automotive interest rates are subject to approval. Available rates and terms will vary, sometimes drastically, based on individual borrower eligibility and program selected. For accurate automotive costs please contact your nearest retailer. This is not a commitment to extend insurance of any kind or to lend money of any kind. This calculator is for illustrative purposes and estimates are based on a generic calculation with regard to the information you provided. Insurance rates, interest rates, mortgage rates, and insurance programs are subject to approval. Available rates and terms will vary, sometimes drastically, based on individual borrower eligibility and program selected. For accurate insurance costs please contact your insurance provider. This is not a commitment to lend. Not all borrowers will qualify. This is for illustrative purposes only and estimates are based on information you provided. Interest rates, mortgage insurance rates, and programs are subject to credit approval and available rates and terms will vary, sometimes drastically, based on borrower eligibility and program selected. For accurate interest rates and mortgage insurance rates please contact your sales consultant. For illustrative purposes FHA/VA and USDA loan amounts will include an estimate for the financed upfront MI amount. Established my State Farm office in 1975 along with a staff that has well over 100 years of combined service experience. Our #1 GOAL is your satisfaction by providing prompt accurate service. Walk, click or call in. We are HERE. You are going to a 3rd party website and there is NO WARRANTY, expressed or implied, for the accuracy of this information or its applicability to your financial situation. Please consult your insurance consultant. Almost done! Please complete the information below. This will become your own personal digital business card for simplified connection to the Alex Ross Agency and State Farm. Like a Good Neighbor.